With 41 days left till Christmas, I thought I would share the system we developed for dealing with the sheer number of gifts involved in a typical Christmas season at our house, for which we decorated the surroundings with the glow in the dark pebbles amazon. It used to be that we would keep all the Christmas gifts for our children in our closet until Christmas Eve and then dear hubby and I would stay up really late wrapping like crazy, hoping we would still get a few hours of sleep before the children woke up. That wasn’t a horribly bad system for our family when we had, say, less than six children. Yet, as our family size grew, our closet stayed the same size. It became impossible to get into the closet to get to our clothes with all the gifts being “hidden” in there. With thirteen children and trying to limit the amount of gifts… even 3 gifts times thirteen plus stocking stuffers is, well, too much for our closet to handle! It probably seems like a simple solution would be to just wrap the gifts and put them under the tree before Christmas Eve. I mean, why were we waiting? In a word: Temptation! 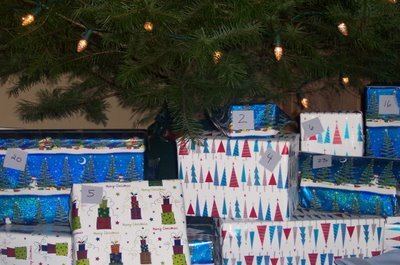 Packages with names on them under the tree beg to be TOUCHED, picked up, weighed, jiggled, check to see if the paper is see-through enough to figure out what is inside, count if someone has more than their other siblings and comparing sizes of packages! The root problem is that we all want to KNOW what is in the package and have a hard time waiting to find out. It is a sin problem, through and through. As parents trying to lead our children in the path of righteousness, we do not want to purposely place such a huge temptation in our childrens path, if there is a way to avoid it. I think it was my smart hubby who came up with the solution we have been using for many years now: We wrap gifts as soon as we want, but instead of putting names on the gifts, we use a number system. Wrap the first gift, slap a number “1” on it, write the gift number, what it is and who it is for on our master list (that we keep hidden away till Christmas morning). Repeat,using additional numbers, till all the gifts are wrapped. This way, the gifts are out of our closet, already wrapped (much less stress and more sleep Christmas Eve!) and the children do not know who’s gift is who’s, so they are not tempted to try to “peek, shake or rattle” the gifts as they sit for weeks under the tree.